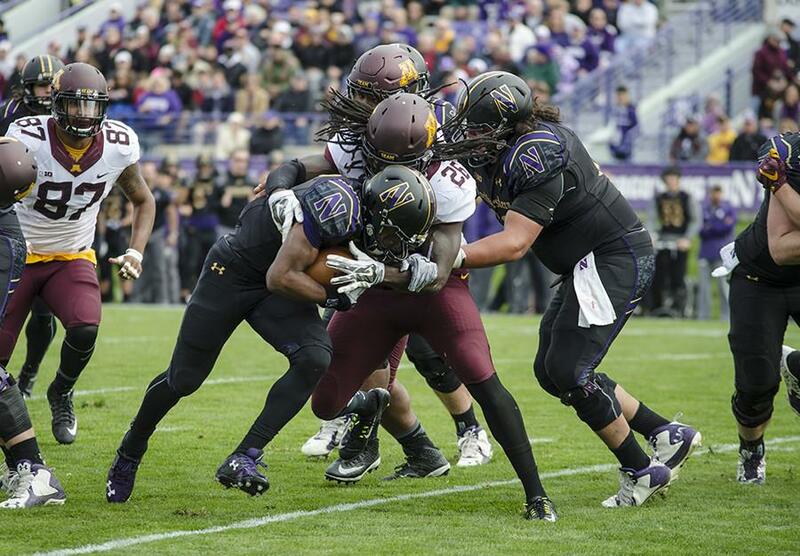 Justin Jackson runs into a Minnesota defender. The sophomore running back will be tasked with keeping Northwestern out of third-and-long situations against a tough Tennessee defense. The Northwestern Wildcats and the Tennessee Volunteers have met exactly once before — in the 1997 Citrus Bowl, which pitted NU’s then-linebacker Pat Fitzgerald against Tennessee’s future NFL Hall of Fame quarterback Peyton Manning. Unsurprisingly, Manning’s offense hammered the Wildcats in a decisive victory. Now, as Manning’s long NFL career dwindles, his old Volunteers have sprung to life, enjoying their most successful season since 2007 — coincidentally the last time they appeared in the Outback Bowl. This year, in the sequel between the two teams, the Volunteers’ defense arguably poses the biggest threat to the Cats on New Year’s Day. Redshirt freshman quarterback Clayton Thorson and his cadre of offensive tools — a unit that has proved unpredictable thus far — will need to be crisp and powerful when they face Tennessee’s formidable defensive squad, a group that limited FBS powerhouse Alabama to under 20 points in a tight matchup earlier this season. Offensive coordinator Mick McCall will undoubtedly give an extraordinary number of touches to star sophomore running back Justin Jackson, along with consistent producers junior Warren Long and sophomore Solomon Vault. Tennessee’s weaker rushing defense plays to the Cats’ strengths. NU averaged just under 200 rushing yards per game during the regular season against multiple defensively minded Big Ten teams. In fact, NU averages about 50 more rushing yards than passing yards per game. But to move the ball down the field swiftly, the Cats will have to produce in the air as well, an inconsistent area for NU in both the quarterback and receiver positions. Plagued by inexperience and mistakes, the Cats are a miserable 119th in the country in passing offense as they have continuously relied on their rushing game and defense for points. Although Tennessee doesn’t have standout pass coverage — the Volunteers allowed their opponents more than 200 passing yards a game this year — Thorson and his pass-catchers will still struggle against a gritty Tennessee secondary. Save for some smart, clean passes, and a handful of big plays, NU will likely keep most of its offense on the ground. If there are two areas the Cats’ offense has struggled this season, it’s third down conversions and red zone efficiency. Unfortunately for NU, the Volunteers’ defense excels in those very same scenarios. The Cats have moved the chains on just 42 percent of their third down conversion attempts. On the road or at neutral sites, this number drops to 31 percent. The Volunteers, however, allow their opponents to succeed on third down only 28 percent of the time, good for fourth in the nation in third down defense. Tennessee even held Alabama — ranked No. 2 at the time — to just under 40 percent success on third down. Short-yardage specialist Long will have to be unusually powerful on short third down conversion attempts, while third-and-long situations will most likely end in a quick, completed pass or, more likely, a punt. The Volunteers’ defense is similarly tenacious in the red zone. Tennessee allowed its opponents to score in the red zone almost 77 percent of the time this season. However, this number is slightly misleading, as the Volunteers allowed a touchdown about 56 percent of the time when their opponent was in the red zone. To put this in perspective, these statistics place the Volunteers in the top-25 in the nation for red zone defense. Though NU has scored from the red zone at a pace of 84 percent, this number, too, is misleading. NU’s field goals from the red zone outnumber its touchdowns, 17 to 15. Getting into the end zone will prove critical for the typically low-scoring Cats. Relying on junior placekicker Jack Mitchell for field goals instead of PATs will cripple NU’s chance of winning. The Cats will have to carefully thwart a trio of Volunteer defenders to gain offensive momentum. Linebacker Jalen Reeves-Maybin, the backbone of the Tennessee defense, leads the team with 99 tackles and has caused opponents 62 lost yards on stops in the backfield. Defensive end Derek Barnett also poses a huge threat to Thorson and his offensive line. Barnett, a 6-foot-3, 267-pound sophomore, already has 133 career tackles, including a whopping 15 earlier this season against a formidable Oklahoma team. Finally, defensive back Brian Randolph has been particularly useful to the Volunteers, recording six 10-tackle games in his five-year career. He’s aggressive and fast, the type of player that NU has had trouble containing in the past. NU’s saving grace will be an offensive line that has performed well under pressure, despite an ever-shifting lineup of players due to injury. Thorson can pass beautifully when given the chance, but often collapses under pressure. Luckily for the Cats, Thorson has some legs on him — which may be his salvation if the offensive line buckles. As for Jackson, he’ll be fine. There’s a reason he’s been given the ball almost 300 times this season.